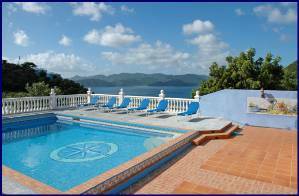 The Spyglass Hill Rental Villa offers a panoramic 360º view from the pool deck encompassing the Sir Francis Drake Channel, the St. John (USVI) National Park, Frenchman's Cay Island and the picturesque island of Jost Van Dyke on the north shore. The swimming pool area is surrounded by beautiful banisters. The circular corner steps, provide easy access for children. The spacious 20 foot by 30 foot pool goes from a depth of four feet at it's shallow end to a depth of ten feet. The oversized living room with 30 foot high ceiling, is furnished with an inviting large sofa and a dining room table that can seat 8-10 people with a complete wet bar. Three fans are installed in this room for additional air circulation. A handcrafted mahogany staircase with adjoining verandah leads to the balcony on the loft which overlooks the living room. Colorful linens and table settings are available for formal gatherings. You will be surrounded by spectacular ocean view from every room. 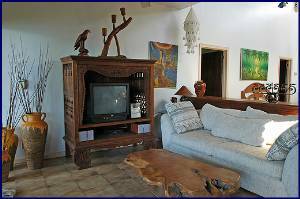 The two floor levels of more than 4,000 square feet of living space are beautifully decorated. 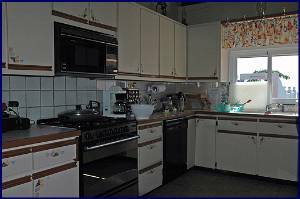 The open Kitchen has a 6 burners gas stove with electric ignition. It is open to the living room creating an ideal setting for entertainment. The Loft area is equipped with additional couches that can be converted into twin beds for teenagers or adults. It provides access to The Terrace. Overlooking Jost Van Dyke, The Terrace is an ideal setting for private sun baths during the day or a quiet hideaway to view the stars during the night. Outdoor furniture has been placed throughout the porches and patios for "al fresco" dining. Automatic shutters surround The Porch that can be used for security or shade. 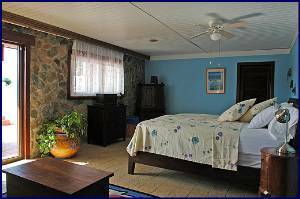 Three of the bedrooms have direct access to the wrap-around porch and feature overhead ceiling fans. 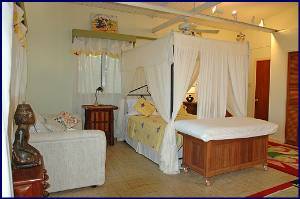 The smallest bedroom has a standing fan and four poster full size bed. The large pink master bathroom has a bathtub and a closet with plenty of bath and beach towels. The beige master bathroom has a walk-in shower. It is located in a small walkway connecting the bedroom with the living room. See the floor plan for detail. The spacious half bathroom is conveniently located between the bar and one of the bedrooms. It has a door from each side to facilitate access to the guests. The Game Room, a separate building from the main house, is equipped with a pool table and a dart board, providing an ideal getaway for children.